More than 20 years ago, chemist Philip P. Garner reported the synthesis and configurational stability of a differentially protected serinal equivalent 1 (Figure 1) (Garner 1984, Garner & Park 1987), which today is commonly referred to as Garner’s Aldehyde. Since its disclosure, both enantiomers of 1 have been widely used as chiral building blocks in stereoselective synthesis of sophisticated molecules like amino acids, amino alcohols and amino sugars (Liang et al. 2001). Therefore, 1 embodies a prominent representative of the so-called chiral pool. Projected commercial interest in Garner’s Aldehyde 1 stems from its pronounced utility in short-step synthesis of pharmaceuticals or drug candidates bearing one or more chiral centers (Figure 1). In line with this, a plethora of biologically active molecules differing in structure were synthesized from 1 in few steps. For example, 1 was the starting material in the synthesis of imino sugar C-glycosides (Takahata et al. 2004), carbacepham antibiotics (Avenoza et al. 2002), NMDA antagonists (Muller et al. 1993), natural antibiotic furanomycin (VanBrunt & Standaert 2000) and furanomycin derivatives via chiral allens (Erdsack & Krause 2013), and glycosphingolipid glucocerebroside (Murakami et al. 2005). In a similar way, 1 has been taken as the starting point in the synthesis of Furo[3,2-b]furan-2-ones (Erdsack et al. 2007). Garner’s aldehyde 1 is unstable in both strong acidic and basic media. Prolonged exposure of 1 to acidic conditions causes ketal degradation and cleavage of the BOC-protecting group, whilst certain basic reaction conditions cause racemization of the chiral center. To that end, more resilient building blocks based on 1 are highly desirable for reactions carried out under harsh conditions. A protecting group swap from BOC into more stable substituents such as CBZ (Z) or Tosyl (Ts) offers the easiest way, yielding much more viable molecular structures of type 2 and type 3 (Figure 2). Synthetic intermediates derived from 2 or 3 may turn out to be much more robust than their BOC-protected counterparts. For instance, application of N-tosyl auxiliaries of type 3 can result in isolation of crystalline material rather than oily compounds (Erdsack et al. 2008). Recently, a more advanced building block derived from 1, alkyne 4, has become a matter of particular interest (Benfodda et al. 2015). A. Avenoza, J.H. Busto, C. Cativiela, F. Corzana, J.M. Peregrina, M.M. Zurbano, Asymmetric Hetero Diels-Alder as an Access to Carbacephams, J. Org. Chem. 2002, 67, pp. 598-601. Z. Benfodda, D. Bénimélis, G. Reginato, P. Meffre, Ethynylglycine synthon, a useful precursor for the synthesis of biologically active compounds: an update – Part I: preparations of ethynylglycine synthon, Amino Acids 2015, 47, pp. 271-279. J. Erdsack, M. Schürmann, H. Preut, N. Krause, (3R,3aS,6R,6aR)-tert-Butyl N-(6-chloro-2-oxo-6a-phenylperhydrofuro[3,2-b]furan-3-yl)carbamate, Acta Cryst. 2007, E63, o3371. J. Erdsack, M. Schürmann, H. Preut, N. Krause, (1R,4′S)-4-(tert-Butyldimethylsilanoxy)-1-[2,2-dimethyl-3-(p-tolylsulfonyl)-1,3-oxazolidin-4-yl]but-2-yn-1-ol, Acta Cryst. 2008, E64, o1171. P. Garner, Stereocontrolled addition to a penaldic acid equivalent: an asymmetric of threo–β-hydroxy-L-glutamic acid, Tetrahedron Lett. 1984, 25, pp. 5855-5858. P. Garner, J. M. Park, The synthesis and configurational stability of differentially protected β-hydroxy-α-amino aldehydes, J. Org. Chem. 1987, 52, pp. 2361-2364. X. Liang, J. Andersch, M. Bols, Garner’s aldehyde, J. Chem. Soc., Perkin Trans. 1 2001, pp. 2136-2157. M. Muller, A. Mann, M. Taddei, A new Method for the preparation of (2R)-2-Amino-5-Phosphonopentanoic Acid, Tetrahedron Lett. 1993, 34 (20), pp. 3289-3290. H. Takahata, Y. Banba, M. Sasatani, H. Nemoto, A. Kato, I. Adachi, Asymmetric synthesis of 1-deoxynojirimycin and its congeners from a common chiral building block, Tetrahedron 2004, 60 (37), pp. 8199-8205. M. Pete VanBrunt, R.F. 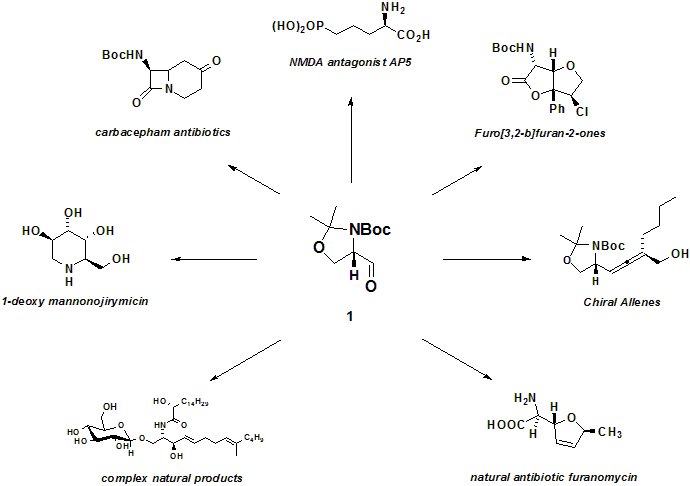 Standaert, A Short Total Synthesis of (+)-Furanomycin, Org. Letters 2000, 2, pp. 705-708.